Official release Sept. 16, but NOW available. Brandon Blake, the police wannabe from Port City Shakedown -- first of Gerry Boyle's second, and grimmer, series, this one in Portland, Maine -- has made it onto the force at last. But he's still a rookie, partners with his ultra-fit training office Kat, and his emotions run high and stormy. Raised by his grandmother for the worst of reasons, Brandon's "inner child" is raging. Unfortunately, he's got little control of that emotional demon. And when a new mom who's a long-time druggie with nasty boyfriends turns out to have really "lost" her baby -- taken from the filthy apartment somehow -- Brandon's lack of control becomes a liability to his work. With Kat, he questions a street-living woman named Lizzie, hoping that older woman might have noticed something that could help with the case. She's not exactly on target, though. "Nah. Ain't seen nothin'. Got f*in' gum, Blake?" "I got gum, Lizzie." He reached into his shirt pocket, took out a pack. Held it out and the old woman snatched it away, stuffed it somewhere under her layers. Sweatshirt, sweaters, greasy parka. "You think of something you forgot, you give a shout, honey," Kat said. "I had a baby," Lizzie said. "Gestapo took it." "Had the devil in her," the old woman said. "You gotta drive a stake in 'em. You gotta drive a stake through their little hearts." She smiled, not quite toothless. They looked at her uneasily, got back in the cruiser. "There's a birth mother you don't want to go searching for," Brandon said. "So where do you think it is?" "I don't know," Kat said. "Maybe [the mother] killed him, by accident," Brandon said. "Got rid of the body. Or maybe one of the crackheads killed him, took the body with him when he left, tossed it in the trunk." "Jeez, Blake," Kat said. "Glass half empty or what?" For sure, Brandon Blake lives with the glass half empty. The only part of his life that's sweet lately is the part he shares with his girlfriend Mia, who fell for him during the events of Port City Shakedown. But with Brandon's simmering anger and determination to find the baby, punish crime, find and arrest evildoers -- even when off-duty -- he's not exactly contributing to a balanced home life. And he's making problems for the police team, too. Things get even more tense when Mia brings home new, classy, restaurant-oriented friends, socializing with them on the boat where she and Brandon live, and leaving him dangling as the one who's not much use for the parties. His misery makes the rookie cop try even harder to pursue leads on the baby's disappearance, and other grim realities of the poverty/drugs world at the foulest edges of town. 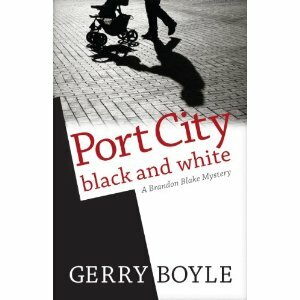 Boyle is an experienced author, whose Jack McMorrow crime series has already honed his sense of pace and tension, and his ability to portray both the desperation of poverty and drug use, and the tenderness of family and friendship when they're allowed to blossom from the rank soil. The Brandon Blake Port City series will be a classic, showing the reality of New England coast life -- a mix of myth and painful reality. Brandon's chances for redemption don't look good, but somehow people end up giving him a chance ... and he may yet solve the case. Whether he'll still have a girlfriend by the end, well, that's another matter. So is the physical safety of everyone involved with him and his dangerous path. 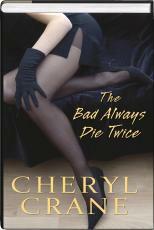 Cheryl Crane, THE BAD ALWAYS DIE TWICE: Clever Twists, Good Characters, Worth Reading! It's got to be tough being the daughter of a Hollywood legend -- even tougher if you're a lovely blond, and have a "past" that includes killing someone in defense of your famous mom. No, that's not the book's lead character I'm describing; it's the author. But in THE BAD ALWAYS DIE TWICE (a cute title riff off both James Bond and James M. Cain), Cheryl Crane pulls off a read that's so enjoyable that I'm glad to recommend it. She cleverly positions her protagonist, Nikki Harper, in shoes quite a bit like her own: daughter of a Hollywood star (one who lives with fabulous wealth -- was Crane's mother Lana Turner able to live at the top like that?) and trained from childhood to provide a glowing smile to the public, no matter what emotions surge underneath. And Nikki's a real estate agent, which is Cheryl Crane's current career in Palm Springs, California. But instead of the child to whom frightening things happened and who a victim of an infamous crime even though she successfully took up a weapon, Nikki Harper has the kind of friends who can help her effectively investigate a death. That is, a double death -- a murder that's happened to a man whose widow was already dating again. And if Nikki can't solve it, she and her real estate partner Jessica are likely to lose their commission -- which in Hollywood is Big Money, indeed. She waited patiently until the young man in the cheap suit jacket glanced up. Nikki moved in closer, lowering her voice. "I was wondering if you can answer a couple of questions about one of your guests." That's because no celebrities would stay here, Nikki thought, but she didn't say it. Instead, she gave him the smile. "This isn't exactly a celebrity. And he's ... was a client of mine." When the clerk refuses to squeal, insisting that "There's been no murders in the Sunset Tower Hotel, ma'am," Nikki's stumped for a bit. Not to mention upset about being called "ma'am" -- does she really look old enough to be a ma'am? But because she's polite and patient with just about everyone, a hotel assistant lets her in on what really took place there, and the investigation is off to a good start after all. And that's the charm of this book: Even with all the luscious distractions of Hollywood life and the gorgeous Victoria Bordeaux (Nikki's famous mother, and smarter than many fans would guess), this high-style real estate agent earns her way to revelations and an eventual surprising solution. I confess, I was skeptical in the first chapter (and at any point where fashion took over the descriptions). After that, I gave in to the pleasure and kept the pages turning. Cheryl Crane knows how to spin a good story. I bet she'll get better, too -- so this first Nikki Harper mystery is worth collecting, as there's already a second on the way. 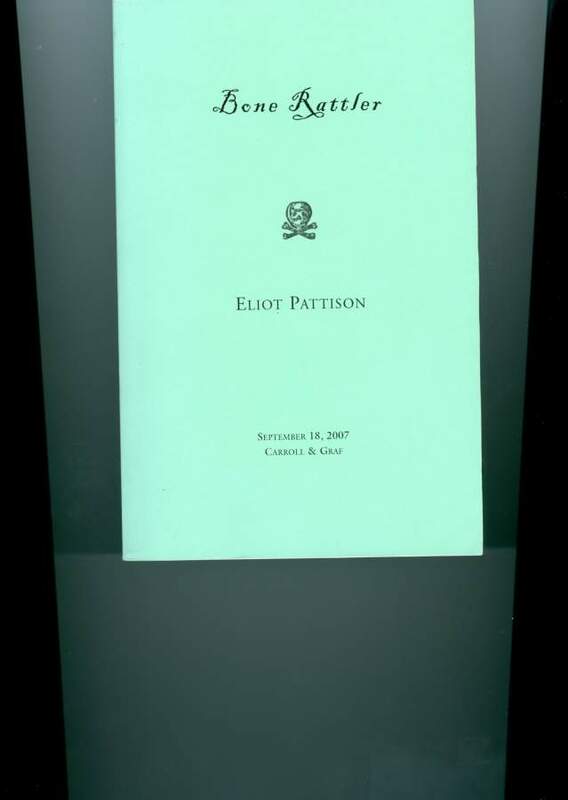 Collector's Corner: Eliot Pattison's BONE RATTLER Mystery Mystery! 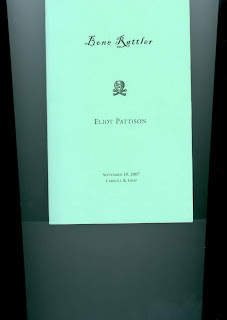 Over the summer we gathered some books for Eliot to sign that we have now placed on the shelves, including his first book, the Edgar Award winner, The Skull Mantra. I also purchased over the summer a green-colored softcover Advance Readers Copy (ARC) of the start of Eliot’s second mystery series, set in Colonial America: Bone Rattler. And here is where the collector's mystery starts. Advance readers copies are given to reviewers and to bookstores, usually months before publication of a hardcover edition. I already had an Advance Readers Copy of Bone Rattler in pictorial covers that was published by Counterpoint in my collection. The edition that I found this summer was published by Carroll & Graf Publishers, and I couldn’t find any information about them publishing Bone Rattler. So, after the customers left and Eliot generously signed some additional books, I handed him the green copy of Bone Rattler to sign. And the mystery finally was explained: Carroll & Graf was to be the original publisher and they went out of business. Counterpoint picked up the contract and published the series. Eliot said that the green ARC is scarce and he didn’t think he had one in his own collection.